Hello I joined this web site more than a year ago and recently made my first introduction post earlier this week . I wanted to thank everyone else whom posted their build journals and pictures and ideas they really helped me with my plans and with a little searching I can usually find an answer to most any questions I have had. I am well on the way on my build and have several things done so here is my build progress over the last several months to get you up to date and to provide my (hopefully beneficial to someone) contribution to this great forum. I started with a card board mockup last Christmas to decide if a 5x10 was the size I wanted to build and if our camping gear would fit. Over the winter I bought and read Steve Fredericks manual and then built a temporary 4’x10’ work table as he and others suggested. I made a full size drawing of what I wanted. Paper is cheaper and easier to change with an eraser than wood. I changed it many times as I drew it up, showed it to my wife and kids and got their opinions and incorporated my ideas from my research from this web site. I prioritize our wants/desires and studied it some more. The picture below doesn't do the drawing justice but you get the idea. During March and April as I figured out what parts I wanted to use I started buying lights, handles, hinges, windows etc. As each of the parts arrived in the mail I adjusted the full size drawing as needed to accommodate the real parts sizes and mounting locations. Below are several pictures of the parts I picked for my build. Even though my lights have switches on them I decided I would like a two way switch for the cabin by each door and a single switch for the galley lights. I located some small switches and made a few light switch panels out of aluminum. I scuffed the aluminum surface switch plates with a DA sander and then cleaned and primed with Bull Dog adhesion promoter and spray painted with clear coat wheel paint. I bought a small stainless steel boat hand rail and made an aluminum plate to use as a galley hatch handle. Once I settled on the design I then joined two sheets of ¼’ plywood with fiberglass cloth and epoxy to make a 4’x11’ panel and laid out my profile, cut the template out and set it against my Jeep to decide if it is what we really wanted to build. I decide I liked the profile and size and thought it would go well with my Jeep. The front was pushed out to allow a shelf and storage compartment up front but not over our heads while lying down. The top was left flat for a sunroof, vent and to maximize head room. The back end was copied off a generic Benroy pattern to maximize galley space and room for two cooler slide outs. I also laid out a rough idea of my galley. It will have two cooler slide outs. One on each side. A shelf for food prep and a place for propane stove, a few drawers for small items and baskets for the rest. 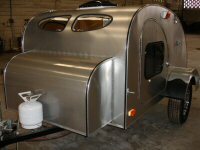 I also will have room to store a pull out shelf that will mount on the outside of the teardrop for cooking. In April I started building my teardrop inside out. I started with the bulk head between the galley and bed as a test panel. I built a 1"x3" frame and used ¾" foam insulation and covered with 1/8” Baltic Birch (BB) plywood glued together with PL adhesive. I wanted to test what 1/8" BB would be like. It was plenty strong. My wife and I decided we needed some color on the plain Baltic Birch and settled on a water based light "Summer Oak" stain from Rustoleum and then finished with several coats of Behr satin water based polyurethane . Since we typically camp with a duffle bag per person and I wanted to save the weight I decided I wanted a shelf instead of cabinets at the foot of the bed. Here is my storage shelf I built out of 1"x2" frame and ¼" plywood. I stained and finished in polyurethane. I then built a shelf to go up top over our heads with a set of reading lights underneath. It was built out of 1x2 frame and ¼ BB plywood. I original stated with a generic Benroy style profile but later decided I wanted some storage in front of the bed as a head board and shelf. Here is the headboard panel I built. It will have a small ¼ plywood shelf once mounted. I created cutouts for drawer pulls and I didn’t want any handles sticking out to hit our head on. I also located a sun roof on eBay and built a frame for it and my roof fan. I glued 1"x2" clear pine together for the spars. I plan to let them sit until needed and see which ones stay straight. On my work bench I created a wiring harness for the trailer lights frame. I decide I wanted a 7 wire junction box under the floor in front of the trailer and one and near the left rear under the Galley. This was to allow me to put a battery in the galley or on the tongue. I also built a wire harness for the stop taillights, backup lights and other lights to be mounted in the Galley. My plan is to run wires from the junction box up to a connector between galley and hatch door and terminate at a terminal strip inside the galley hatch door. I will then wire the lights in the galley hatch to the terminal strip. In July After we got back home from a 3 week family camping vacation to Northern California to take the kids to all of the National parks I ordered my metal for my trailer frame. I had been working on my design and finalized it and during the month of July welded my frame. I used 14 gauge 2"x2" square tubing for outer frame and first cross member and 1/8" 2"x2" angle iron for the middle cross members. I determined how to mount my lights, stabilizers, axle etc. based on research from this web site. I wanted a trailer that was able to go on wash board roads, mild off road trails and highways. Originally I was going to use a 3500 lb axle so I could get the larger electric brakes and mount 5x4 ¼ Jeep wheels. My research and past experience with trailers and a spring system says it bounces too much when empty and even with shocks I wasn’t sure it would work as I wanted. I did more research on different axle type and decide I wanted to try the Timbren axles system. I ordered from E trailer a Timbren Axless system (ASR2KHDS01). It is a 3500lb axle with de-rated 2000 lb rubber springs. It accepts the larger hubs and electric brakes and with a 2” wheel spacer will allow me to mount matching Jeep wheels. I mounted my axle using the trailer balance spreadsheet and then etched and painted my frame with TP Rust Cover paint in satin black. After painting I installed and wired my lights. I then took it for a test drive around the neighborhood. My side panels will cover the frame so the lights I made small mounts and welded them below the frame. I then made a dolly so I could remove the axles to fit through the double door to my utility room so I can assemble the body over the winter and roll out in the spring, bolt on the axles and finish welding the cross bar and take it on its maiden outing. In late July/Early August built, my floor frame out of 1"x4" and 1"x3" with ¾” foam insulation and covered with 1/8” Baltic Birch (BB) plywood on both sides. I then covered the bottom with 7 oz fiberglass cloth and Raka epoxy. I then rolled on a coat of duplicator bed liner to make it black and provide additional protection. I put epoxy on top and finished with a coat of satin polyurethane. I mounted it to the frame with several elevator bolts. Here is a picture of my finished frame with profile template. I used my template and cut out the side panels and door skins with a router bit. I had one issue as the stop for the top bearing on the router bit came loose and I gouged my side panels a little bit. Since I plan to paint with smooth Monstaliner bed liner paint to match my Jeep yellow I just filled the gouge with epoxy filler and smoothed the edges. This past weekend I bought some 1"x4" and 1"x3" pine boards and laid out my side panel frames on top of my template. I use biscuits and glued them together on the table and once dry removed them. I sanded the side smooth to remove glue spills. I also glued the door frames together waiting on them to dry. Last edited by kayakdlk on Fri Jun 13, 2014 9:59 pm, edited 8 times in total. Wow! That is some first post Looks like a great start I hope you post again before you are camping in it. Great build & informative thread. This bit of information is good to know for those that consider using Timbren system on a lighter weight trailer and be able to have brakes. Good find. Wow, that's a heck of a first post! I'm interested in the timbren axle too. It looks like you have things well planned out and your build will probably go together pretty fast! We're watching! Going good. Have a name for it yet? Nice work! I like the independent suspension too - Also like the third brake light, I am going to add that to my build. Nice work planning it all out, good quality materials, and very nice electrical work. 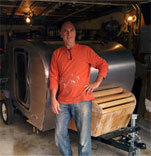 You, sir, are building a mighty fine camper! Post more often; this is the kind of build that gets lots of attention! Thanks everyone for the looks and nice comments. As for a name for teardrop I am still undecided. Before I joined this forum I named my Jeep “Weekender” and put the custom decal above the Rubicon label on my Jeep hood. I decided on this name since I really only use it on the weekends. I was thinking of the name “Weekender Tow” for my teardrop but see that on this forum the Weekender name implies a specific profile shape, of which mine is not. I will see as I build it if another name comes to me. As for the third brake light I decided the more lights the better to hopefully avoid a collision. I wanted lights down low on the trailer frame so I could get the trailer with just the floor licensed this fall and then will be putting lights in the galley hatch and moving the license plate to the center like I did on my Jeep. A few months ago when I built my trailer wiring harness I had all of the lights on my work bench and connected together with alligator clips and then plugged the 7 pin connect into both my Jeep and truck to test and make sure I had everything wired correctly. The plan with the lights in the galley hatch is they are more at eye level with the driver behind me so they shouldn’t miss them. The bottom portion of my hatch is vertical and flat lights will be visible from the rear. Here is diagram of what I have planned. There seems to be several interested in the Timbren axle, so when I get some time I will create another topic and post about my reasoning, and experience with installing it. Look for more build pictures in the next several weeks as I get more done on my build. I would suggest you put the third brake light up a bit higher. Driving to school tonight, I was in traffic behind a pickup truck that had no brake lights. Fortunately, I could see the third light on the car in front of him through his windshield, but only because it was up high enough! Really helped in stop and go traffic. I have also seen some that flash multiple times whenever you hit the brakes, really gets your attention but becomes annoying fast in stop and go traffic. Good job in your planning. I like the idea of the stick built walls and insulation. I'm planning the same method on my build. I to am interested in to axel. I will be looking forward to the future information. Good job. Wow, Lots of great information and pictures in your first post. Thank you for including some unique parts in your build, as it creates ideas for those of us still making decisions on their build. Love the extra lights idea. I am impressed, looks great! I spent the weekend (1/2 day Fri, Sat and Sun) working on my build. Went pretty smoothly. Lot of waiting on glue drying but with working on the trailer floor and the table I built I can get quite a bit done at once. I glued the interior and exterior skins to the door frame and routered the edges and the windows. I used my side template and routered out the side panels I had glued together using a top bearing router bit. I had some issues with the router bits. While cutting the first side the bearing on the router bit I bought new for this project blew apart and I gouged my side panel (nothing a little epoxy wood filler didn't fix). I then bought another identical bit from Home Depot thinking it was fluke before I got finished the bearing froze on the second bit. I then returned both and got another bit a Lowes that had a much bigger bearing. For a few areas I pre cut with the jig saw so the router bit had less wood to cut through. I was then able to finish my sides panels and door opening. I then proceeded to cut out the shelf for the headliner and spars. I decided to try the jig saw instead of the router. I went slow and it came out pretty good. I touched up a few spots with the belt sander. I then glued the outer skins to the side panels. Once they were dry I scraped off excess glue and then laid the side panels back to back and the skins were identical but the frame overlapped in a few spots so I trimmed them with the router. I then checked the headliner shelf with a scrape piece of 1/8" plywood and a spar. It was good all the way around. I then decided to test fit the sides and bulk head to the trailer and floor to make sure they fit before I skinned then insides. Here is the sides clamped on for a test fit. Here is a cabin view of the test fit. I sat down through the door opening and then got in and laid down in it and checked the fit. I also put the headboard I had already built to make sure it fit (sorry no pics). I also tested the location of my sun/moon roof assembly and decide it was in the correct spot after laying down inside. While I was waiting for glue to dry I built a test door handle assembly. I used scraps and made a sample door and then the door jam/seal. Wanted to make sure I knew how it went together before cutting on the real think. Next is to fill in the sides with insulation, and start gluing on the interior skins. It may be a while before more progress as we are going camping/Fishing and Jeeping this weekend. Our last trip for the summer since the kids are back in school and it will be snowing before you know it here in Colorado. wow - lot's of progress, you are doing great work and inspiring me to get mine done!